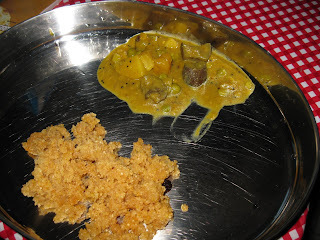 My Receipes: Thiruvadhirai Kali & kozhambu. I wanted to make kozhambu for thiruvadhirai. But my father in law made it instead. 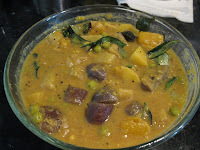 So my husband asked me to make it for Pongal.keeping that in mind I visited your blog and viola!! I found that you have also made it.Im making a note of your recipe ,shall try it and let you know. Thanks for ur comments on lubna's blog.Inviting you to participate in the bread mania event. Parkave nanna iruku..Pasikaradhu..My favo Kootu.. 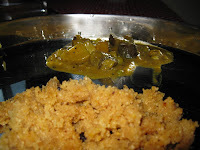 Hi..Thanks for visiting my blog and adding me in your blogroll.. i would also be adding you in my blogroll.. Thiruvadhirai kai is something which i always wanted to try.. now i have ur recipe , shall try and let you know.. The recipie and the steps you given for thiruvadhirai kali were very nice; we also tried but in a bit different way with arisi mavu. Next time, will definitely try your recipe.